It is easy for people to fall for the 49ers. They play smash-mouth football, have a new, young, head coach, and burst onto the scene with a 13-3 record last season. The harder part is looking below the surface. This was a team that benefited from performances that will be nearly impossible to repeat in 2012. Their turnover margin was historic. Their health would make Jack LaLanne jealous. Alex Smith threw for an amazingly low interception total. San Francisco added more receivers this season, but to what end? Throw the ball more, or throw the ball deeper, and those interceptions are almost certain to rise. Seattle has nothing to fear from big receivers like Randy Moss. Vernon Davis and Delanie Walker are a terrific tight end duo that will challenge the Seahawks linebackers and safeties. The 49ers offensive strength is in their backfield. Frank Gore is joined by LaMichael James and Brandon Jacobs. The best of the bunch might be Kendall Hunter. Last year was not a fluke. San Francisco was every bit as good as their record indicated. The Seahawks are better this year when both teams are healthy. The 49ers will be hard-pressed to stay as healthy as they were last season, and it is hard to imagine their offense making up the points they will lose from the field position gained by all those turnovers. The interesting thing will be to see how Jim Harbaugh deals with adversity, given he had none in his first season. The players put up with his hard-nosed style when everything was great. Don’t be surprised if that changes when things become less rosy. This is a team that deserves to be the favorite in the NFC West, but I expect no more than 10 wins. People will sleep on the Rams at their own peril. Jeff Fisher is a coach that gets the most out of his talent. Sam Bradford has the talent to be the best quarterback in this division. He was poorly-suited for the offense the team ran last year, but should rebound this year. His work ethic is great, and his skills are worthy of his #1 overall selection status. His offensive line and lack of great targets could be his undoing. The defense was better than it showed last year. The defensive line is strong, and is backed by an underrated linebacker in James Laurinaitis. The secondary added some talent in free agency and the draft after going through mind-boggling injuries last season. Trading their 1st round pick this year has the franchise setup to add tons of top-shelf talent in coming years. This may be the last season the Rams lose more than win for some time. Many will overlook the Cardinals because their quarterback situation is so easy to mock. Their defense is a legitimate Top 10 unit that will keep them in every game. Their running game has been strong, and Larry Fitzgerald is one of the best players at any position in the NFL. More troublesome than their quarterback questions will be their offensive line that has already had big injury problems. Poor pass protection, coupled with underwhelming quarterback talent will limit how good this team can be. They will not be the pushover early in the season that they may be later. Predicting NFL seasons is silly. Take a look at my past performances. Injuries, weather, and a host of other variables will randomize the outcomes beyond what any human can anticipate. The Seahawks defense is beyond good. They are dominant, and have the potential to be the NFL’s best this season. Defenses that good make the playoffs. That is without factoring in a much-improved offense. Even if Russell Wilson is just an average rookie quarterback, the offensive line and running game will make games like the terror at Cleveland last year a thing of the past. The best kept secret around here is that the Seahawks averaged 24.9 points per game in the last half of 2011. That would have ranked 7th in the NFL, if it held for the full course of the season. After watching every public practice for the Seahawks during training camp and every snap of the pre-season, I am convinced this season will be special. 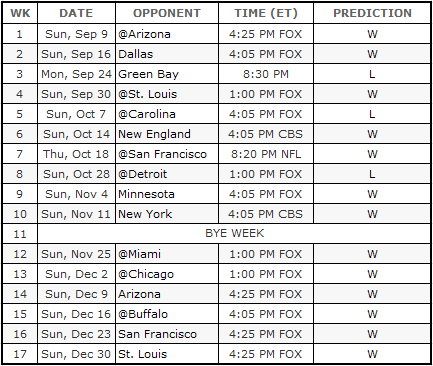 The safe prediction would be a strong step forward into playoff contention and challenging for 10 wins. Expect more from this team. They are better in every single aspect of the game than they were a year ago, and they were already damn good in many of them to begin with. They are young, focused and talented. This year marks the first time in at least five seasons that the ceiling for this team includes the Super Bowl. Every single thing would need to fall in place to reach that lofty height in 2012, but it is possible. The floor for this team, if healthy, would be 9 or 10 wins. Playoffs are an imperative. Anything less would be a failed season. Settle in, Seahawks fans. The show is about to begin, and it is bound to be a thriller.